Just Thinking....: Debut Novel!! 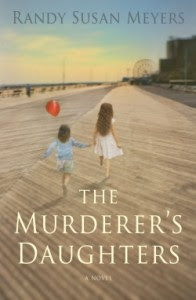 The Murderer's Daughters! Randy Susan Meyers was my guest this morning. We spent 20 minutes or so chatting about this fabulous book but I could have gone on and on....this is my new favorite book! Love a great debut! Randy is a storyteller with quite a story to tell! The pages kept turning and I didn't want the book to end. At the same time had to know how sisters Lulu and Merry reconcile lots of feelings/issues. To have witnesses a father killing a mother -and then be left to care for each other. Who wants to have the murderer's daughters around? I DO! !